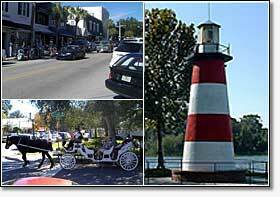 Welcome to beautiful Mount Dora and the Florida Golden Triangle! Judy Kelley is a full time professional Mount Dora Realtor specializing in the sale of Mount Dora single family homes, lakefront property, estates and investment quality real state. Mount Dora is very different from the coasts of Florida. We are close to Orlando, but far from the hustle and bustle of the big Florida Cities. Our small town laid back atmosphere attracts thousands of visitors a year and many decide to enjoy our lifestyle year round. Some of the largest lakes in Florida are located within our borders. The Ocala National Forest in just a few miles to our north and the popular Daytona beaches are just an hours drive away. We are the home of the largest natural Chain of Lakes in Florida and literally thousands of small lakes and waterways. Our landscape is painted with pristine waters, abundant wildlife, hilly terrain, giant moss draped oaks, vast pine forests and friendly people. Mount Dora, Eustis and Tavares have wonderful small downtown shops and restaurants where an evening walk on the lakeshore is just a few steps away. Boating, fishing, water skiing, golf, hiking or horse back riding in the Ocala National Forest are just a few of the pastimes enjoyed by our residents. Popular events like the Mount Dora Art Festival, the Craft Festival and the Antique Boat Festival attract hundreds of thousands of visitors a year. Classic car shows are common and motorcycle riding is very popular with visitors and residents alike. Best of all, real estate prices are affordable and our cost of living is much lower than you would expect. Full time residents enjoy a $50,000 homestead tax exemption and Florida does not have a personal income tax. If you would like more information about living in the Mount Dora area, contact us. We would love to show you around our home town!